We sell and ship Billy Goat Outback Brush Cutter Parts! 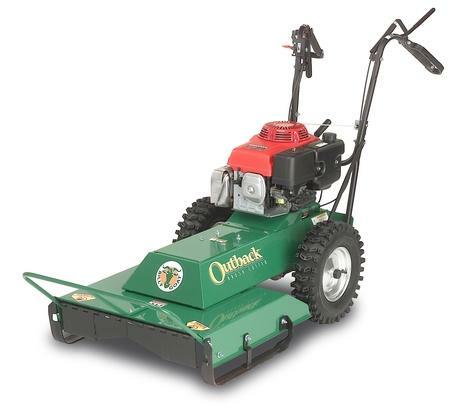 A proven performer, the Outback ® BC24 is a 24" commercial duty walk behind brush mower capable of cutting down dense brush up to 6' high, grass and weeds over 8' tall, and saplings up to 2.0" diameter. It's designed to take the abuse of hitting all those items hidden in the brush such as rocks, stumps, fence posts and tires. Enclosed drive components protect drive belts, pulleys and the drive system. Mowing steep slopes? The Billy Goat Outback has a low center of gravity for stability and rugged tires for sure footed traction. The optional Honda engine model can handle 20 degree slopes and maintain proper engine lubrication. With years of proven performance, the Outback BC24 is a rugged 24” walk-behind rotary mower. This commercial duty brush cutter is an excellent choice for cutting brush up to 6 foot high, weeds and grass up to 8 foot tall, and young saplings up to 2 inches in diameter. The BC24 is built to withstand abuse from encounters with rocks, stumps, fence posts, tires and other unseen objects covered by thick brush. A rugged blade spindle reinforced on each corner gives an unwavering performance during demanding tasks. A heavy-duty drive belt connects the blade spindle to the engine maximizing performance and ensuring that you continue cutting even in the toughest environment. Drive components like the drive belts, pulleys, and the drive system are enclosed for ultimate protection. With a low center of gravity and 16” rugged tires, the Billy Goat Outback has great stability - hugging the ground even on steep slopes. The optional Honda engine can still maintain proper lubrication on 20 degree slopes. It is outfitted with a 3-speed mechanical transaxle with reverse and a protected rear-mount clutch. Wide, padded control handles with steel knuckle guards protect the operator’s hands and give excellent leverage in deep vegetation. The rigid deck’s rear-discharge is angled to prevent packing and creating windrows. 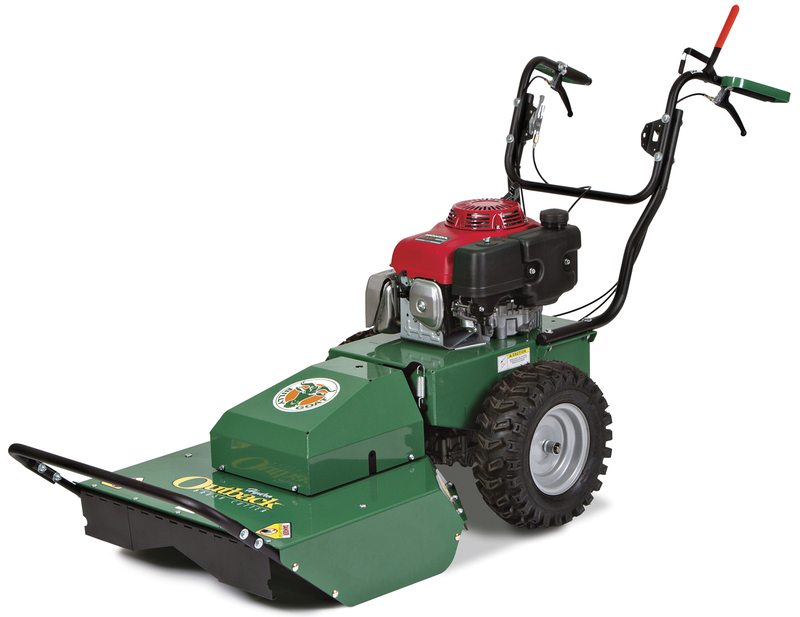 The Billy Goat BC24 remains an excellent choice for clearing any overgrowth that can be pushed over. Mow down overgrown meadows or reclaim properties that haven’t been maintained the easy way.